In the context of the most recent elections to the European Parliament (May 2014), the Institute of Contemporary History of the New University of Lisbon brought together in one single volume several contributions by scholars from different scientific disciplines on the European parliamentary elections in Portugal. The book is coordinated by Professors Maria Fernanda Rollo (currently Portuguese Secretary of State for Science, Technology and Higher Education), José Maria Brandão de Brito and Alice Cunha. This book is relevant not only because it marks the event, but more importantly because it offers innovative perspectives on the study of the elections to the European Parliament in Portugal and the European Parliament itself. It includes chapters on the role of the European Parliament, electoral participation, the Portuguese autonomous regions (Azores and Madeira) and the European elections, the media and the European elections, political parties and trade unions. We are convinced that it constitutes essential reading for students, scholars and citizens in general. We hope you enjoy the book too! 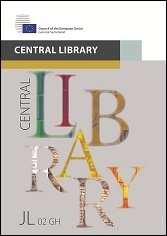 The Central Library located in the Justus Lipsius building, at JL 02 GH, Rue de la Loi 175, 1048 Brussels (Froissart entrance) – Opening hours Monday to Friday 11.00 – 15.00. It is open to all staff of the Council of the European Union and the European Council, trainees, Permanent Representations of Member States, staff of other EU Institutions and bodies, as well as to researchers and students (upon appointment by e-mail at central.library@consilium.europa.eu). Access to some Library holdings might be restricted to on-site consultation.